Just Jingle: Fireworks, Flowers - they are pretty much the same thing, right? Fireworks, Flowers - they are pretty much the same thing, right? We have a brand new challenge for you up over at Gourmet Rubber Stamps! This is a SUPER fun one, too!!! The challenge is to use a stamp in a way it was not originally intended! YAY! FUN!!!! You KNOW you want to try this challenge! It's the kind of thing you see other people doing all the time and then you think to yourself, "MAN! That was a good idea! Why didn't I think of that?" Well, now it's YOUR TURN to think of that! 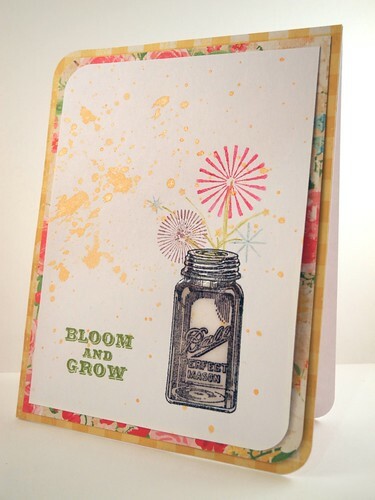 For my card I decided to pull out the Happy Independence set and the Bloom and Grow set from Gourmet Rubber Stamps. I used the fireworks as the flowers in my jar! They were the perfect size and I simply colored them with watercolor crayons, spritzed them with water, and stamped them onto my card! A bit of shimmering splatter made for a fun background. I coated the jar with liquid glass, too! It was kind of funny, actually...I had a hard time with this challenge. I found that odd, considering I regularly use stamps in odd ways, but for some reason when someone told me to do it - it became difficult! LOL! But, it was super fun to start combing through my images and finding fun new ways to use them! I hope you play along! This is my first of two posts today. At 2pm Eastern Time you will see my FINAL card for the Paper Crafts Gallery Idol competition!!! This is the last round! I'm so excited! Don't forget to check back for that one! oh what a fun fun card! What a great way to use fireworks! I love the Ball jar stamp! Great use of the fireworks! fireworks flowers..so clever!! LOVE!!! and love the bell jar too! So fun and festive. I love anything having to do with Ball jars, and I've never seen a card like this! 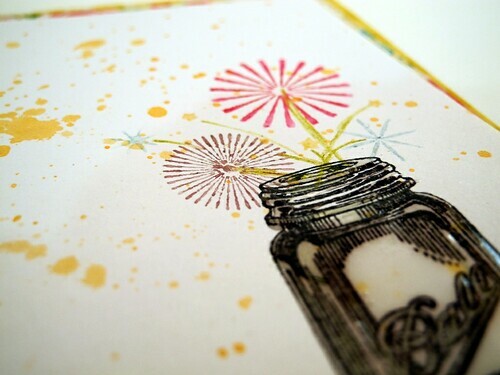 cool idea to use the fireworks stamps as flowers. the jar looks like it has dimension which is really cool too. :) love this! What a great idea love the jar stamp. Cute idea and LOVE that jar stamp! Super fun card ~ what a great look with the fireworks! Love it!